In ancient times, you would literally be slave to the lender. That means you would do whatever the lender wanted you to in order to pay back that debt. Luckily it’s no longer like that – but the principle still applies. You still are a slave to that lender. If you don’t pay them, they’ll start breathing down your neck, won’t they? They’re not giving you money out of the goodness of their hearts, they’re lending that money and expecting interest to boot. The sooner you back back your debt the better. I know this is a controversial post – but it’s the truth. It’s controversial because it goes against the grain of modern day society. When it comes to loans and the interest that incurs on it, it’s brutal. I know because I’m in it. My husband has over $150,000 worth of student loans with the average interest rate of 6.8% with a life of the loan at 10 years. If we didn’t pay off our debt sooner than 10 years, we’d be looking at a loan that grew to $207,145 with monthly payments of $1726. I don’t know about you – but I want that $1726 in my pocket rather than forking it over for the next 10 years. How about that increase of $57,145? Heck no. I don’t think so. What’s good about paying over ⅓ of the loan in 10 years? Nothing. Sure, you invested in yourself. I get that. But, there are other methods of investing in yourself than going into debt. Who cares about credit scores? Credit scores credit scores credit scores. That’s all I ever hear and you know what? I don’t care what people think about my credit score. Why? Because once you dangle cold, hard, cash in front of people – it’s way more enticing. Not to mention what your bank account can say for you. Chances are that you’ve been wise with your money and you’ve invested it nicely over the years. 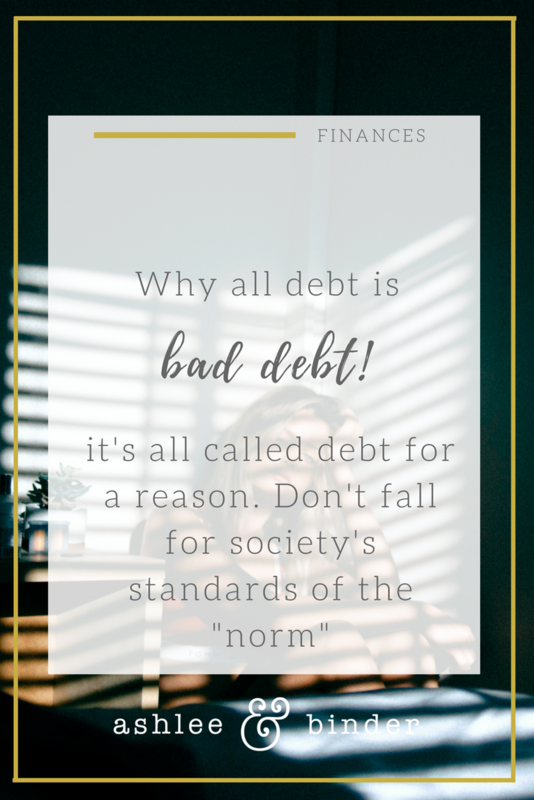 You don’t need to show that you’ve been paying on your debt successfully for years, because you’ve been taking that money and stashing it away which has grown consistently over the years and that compound interest is now working for you instead of against you. Sure, you might have to pay a little bit more initially. But, in the long run you’ll save yourself on interest alone. Yes, you read that correctly. You don’t need to have a credit card to purchase things. You can buy them with cash – gasp! Or by using your debit card. I highly recommend that you use the envelope cash system in order to stay on track with your budget. If you’re weary of having that much cash on you at one time, that’s totally understandable. I’m weary too! I pull out cash weekly instead of monthly to only have about $150 on me at any given time at the most! In our society, we want it and we want it now. Don’t we? The idea of patience and waiting has flown out the window. I want to encourage you to be patient and wait until you can save up to buy it for several reasons. First and foremost, usually when I want to buy something and I wait 24 hours – I look back on it and at the end of the 24 hours, I don’t want it anymore. I do this on most purchases over $100 and it’s saved me thousands upon thousands of dollars. I seriously cannot tell you how much it’s saved me. When you work hard for something, you learn to appreciate it more. It’s the same concept with kids too. If you make them do chores to earn money, they’ll take that hard earned money and buy something that they’ve always wanted and treat that thing like it’s the crowned jewels, right? It’s the same concept for adults. Because you worked so hard to save up money for it and you finally bought it, chances are that you will appreciate it so much more. Don’t fall into the trap that society has laid out. So many have fallen into it. You don’t need debt to get ahead. Debt makes you fall behind, actually. You don’t need to keep up with the Jones's because who cares about them? They’re doing their own thing and so should you. If you focus on your family needs I think you’ll find that you’ll have more time and money to put into your family instead of looking at everyone else and trying to keep up. You’ll never keep up because there’s always someone bigger and better.